UCCS Army ROTC cadets are preparing for a three-day weekend field training for the summer. Each semester, cadets of all grade levels in the UCCS Army ROTC program will participate in a three-day weekend field training on April 15 at the Air Force Academy. This training will condition them for their month-long summer training in Fort Knox, Kentucky. Several colleges will participate alongside UCCS. The goal is to get cadets mentally and physically prepared for the Active Camp training in the summer, according to senior nutrition major Alexis Caponera, public affairs officer for UCCS Army ROTC. “We will have about 20 to 25 juniors from our ROTC, but the total program will have about 120 cadets participating. We take students from Colorado College, some online universities and other local universities. CU Fort Collins will actually be coming down and bringing cadets with them to train with us,” Caponera said. According to Caponera, it is beneficial for cadets to learn to work with other ROTC students. “When you go to (the Advanced Camp in) Kentucky, you will be the only one from your school, and you will have to work with 39 other people you don’t know across several different states. This not only helps strengthen your communication skills but also tests your leadership abilities,” she said. The activities chosen for the weekend, which could include ambush and prisoner of war training scenarios, are structured after the missions that will be carried out during the Fort Knox field training. “UCCS Army ROTC train students with the same missions that the U.S. Army conducts in war scenarios as some students may face the same scenarios if they’re deployed,” said Caponera. “Cadets will be training on 24-hour continuous missions where they will have to plan out their mission and tasks, map their coordinates, work under pressure and execute the proper procedures for an ambush and searches for prisoners of war,” Caponera said. Senior Army ROTC students are responsible for planning the events and judging juniors’ performances, said Caponera. “We have already gone through this training, so we know what they need to do to be successful and we are there to give them advice,” she said. For Caponera,being a part of the U.S. Army has been a mission of hers since she was young. Caponera will be commissioned as an officer in May when she graduates. “Both of my parents were in the Army; my mom was an Army nurse and she just retired last year with 40 plus years of service. My mom has two older brothers and she is the only female in her family to go into the military, and I’m in the same situation,” Caponera said. For more information on UCCS Army ROTC, visit UCCS.edu/armyrotc. Correction April 12, 2018: The UCCS Army ROTC program has been incorrectly identified as junior Army ROTC. 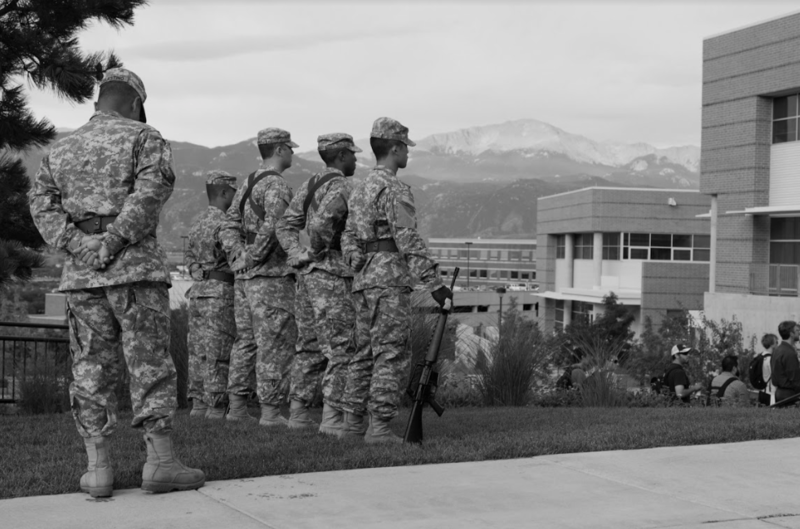 Junior Army ROTC is a high school program not to be confused with the collegiate program offered at UCCS. All cadets will participate in the training; not just those who are of junior standing.